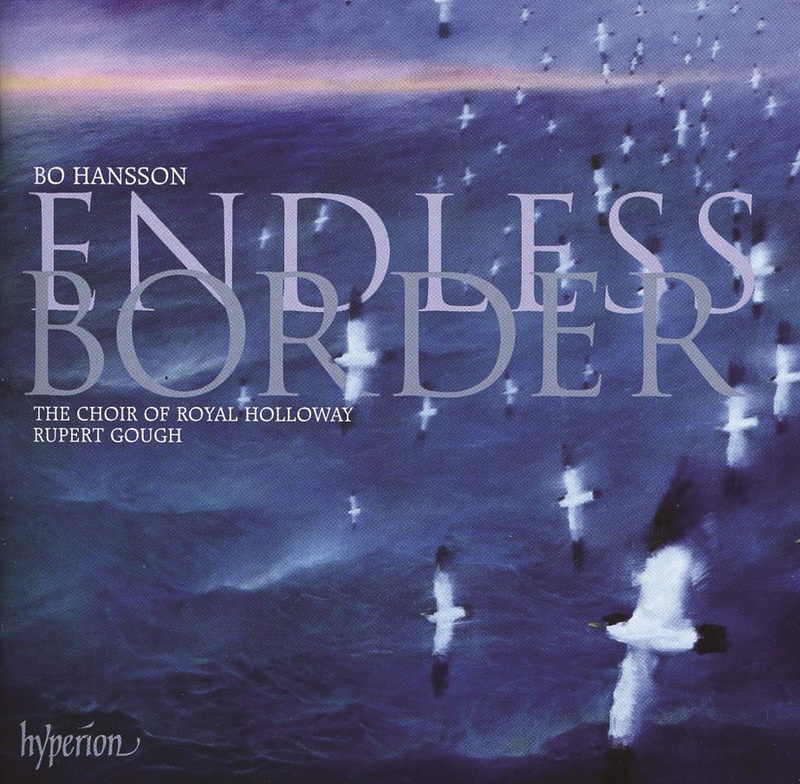 This recording, devoted to the choral works of Bo Hansson (b. 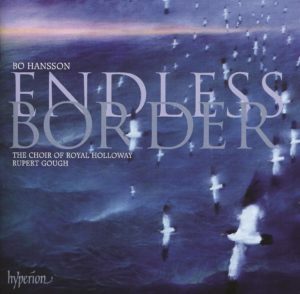 1950), not only pays tribute to the Swedish composer’s melodic choral writing but also to the elegant delivery given by the Choir of Royal Holloway and their director, Rupert Gough. At the centre of this recording is Hansson’s Missa brevis (2008). Around this work, Gough creates a selection of choral musical delights of the a cappella works of Hansson, each with exquisite treatment of text and perfect performance of sensitive musical nuances. Bo Hansson does not just limit his musical talents to composing for the voice. He actually began composing classical choral music relatively late in his life. His earlier career centred round music in the folk and jazz style. The wide variety of influences in Hansson’s life create a fresh musical language which is led by a love for melody, an understanding of the instruments he is writing for, and a sensitivity to each text used. 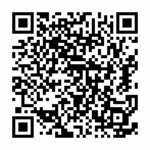 The Missa brevis (tracks 6-9) is for six-part chorus and organ, with the addition of a female-voice descant choir in two to three parts. The ‘Kyrie’ is built on small motifs. Hansson creates a continuous, gently evolving line through the rise and fall of each motif, occasionally modifying the shape of the motifs to reach a little farther from its original, but very rarely moving too far. The voices come together as one at the Christe eleison in perfectly balanced octaves which preludes a hypnotic gentle cascading of the upper voices, at which point the voices converge on each other to bring the Christe eleison section to an end. It is only at this point that one is actually conscious of an organ part. Hansson carefully crafts it to complement and enhance the vocal parts, with the organ part being fully intertwined with the vocal parts. William Baldry’s understanding of how this organ part fits together to create the piece is exceptional, with several sensitive moments making the recording complete. The text of the Gloria from the Ordinary of the Mass lends itself to a mixture of meters in order to preserve the natural ebb and flow of the text. Hansson reaches back to a Gregorian chant-like style in this movement and the interpretation of Gough and his singers takes great care to give the perfect light and shade to each syllable. The glorious build up at the beginning of the Sanctus movement is created through a type of chant building as the voices emerge one after the other beginning with the basses. Gough and his singers hone the creation of the first climax carefully. The pure vocal timbre of the female voices and clear precise intonation enhance Hansson’s writing in this movement. This is followed by the ‘Agnus Dei’ which is the only movement to begin with the sound of the organ. This movement is rather atonal in comparison with the other three movements of the Missa brevis, but once again, the sensitivity of the interpretation by the singers allows the beauty of the Agnus Dei to prevail. Although Hansson’s Missa brevis has several beautiful moments, it is his a cappella pieces on this recording that are the most stunning. The first is Som när handen (As when day dawns), Hansson’s first choral composition which was awarded First Prize in a national Swedish composition competition in 1993. Written to a text by Annika Hultman Löfvendahl (b 1956), we begin at daybreak in unison. From here this piece combines a mixture of compositional devices from the static shimmer of the sun, to parallel harmonic movements, to the cascading melodic lines highlighted in the upper voices. Gough and his singers create effective sound-scapes to enhance the meaning of the text at every moment. Always perfectly balanced even to the final unison note, the work takes us on a complete journey, even though this final unison, which has a very different connotation after such a musical journey. From the outset of Then I Heard the Singing (track 3), the singers of the Choir of Royal Holloway hold the listener in their hand every step of the way as the text describes St Bridget of Sweden’s description, just prior to her death, of the birth of Jesus. Once again, Hansson’s writing is perfectly suited to every syllable of the text; however, credit must go to Gough’s performance with its shape, at each stage of this piece, crafted flawlessly. The final two pieces of this recording, Lighten Mine Eyes (track 10) and Endless Border (track 11), act as the darkness and light and finish off this fine selection of works by Hansson. In particular, the antiphonal interplay between the different groups of voices at the end of Lighten Mine Eyes is rather effective in this recording. The final piece, Endless Border, opens with shimmering descending clusters of sound in the upper voices. The performers are well positioned in this piece in order to make clearly audible the semi-chorus of six soloists surrounded by the rich ten-part chorus. To add to this stunning recording, Gough provides CD notes that are enjoyable for any reader, with the perfect balance of facts to compositional narrative.